Product details - Ingredients- Tuna Loin 59%,Vegetable gelling agent, Fish broth,100% Natural, Suitable- Kitten and Small Cats, Quantity -500 Gm. 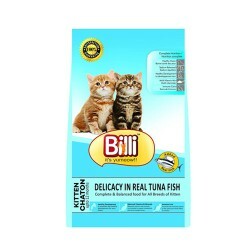 Product Information - Bili adult food is a well rounded everyday diet of meats, fish, grains and other nutritious bits the growing adult need to develop at the right pace. Get your adults growing tummy off to the right start. This food formulated for adult cats over the age of one year. Keep a clean bowl of fresh water available at all times. Be sure to give your adult cat plenty of love, plenty of exercise and see your veteran regularly to help ensure total wellbeing.